I read a post once about a friend who had found a butterfly while clearing out books in his attic. He assumed it was dead, and picked it up gently to have closer look. As the hibernating butterfly absorbed the warmth of his hand it woke up, ‘came to life’ and then fluttered away. 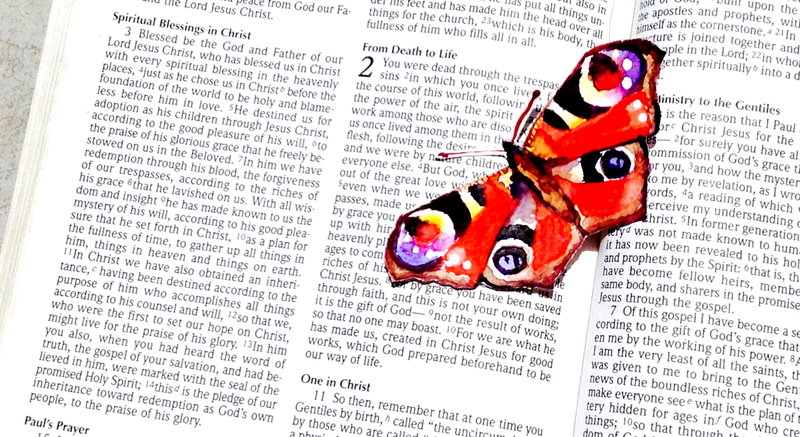 For some reason I’ve been thinking about that butterfly this week, so I’ve painted one, and here it is, resting on one of my favourite pages of the Bible, ready to flutter into life at any moment. I’ve always loved the list of spiritual blessings in Ephesians: holiness, blamelessness, love, destiny, adoption, grace, forgiveness, revelation, reconciliation, redemption, hope, and a guaranteed inheritance. Unshakeable, irrevokable blessings that every single one of us who trusts in Christ can call our own. Each blessing like an individual butterfly, beautiful alone, but even more wonderful dancing together in a glorious symphony of colour. A friend once said to me that if only she could get her head around these blessings, if only she could really understand them and appreciate them, she was sure it would change her life forever. I think she’s right. Catching a hold of the reality of these truths, having revelation of the impact of these spiritual blessings really would change everything. It occurs to me that we all have times and seasons when we lose touch with one or more of these ‘butterflies’. We turn around and our sense of being loved, or having a future, or cleanness, or belonging, or closeness to the Father has disappeared, slipping away quietly in the night. It might even be a while before we notice that it’s gone. The truth is that these blessings cannot be lost, but our awareness of them, and of their importance, can hibernate for a season and be temporarily ‘lost-to-us’. Are any of these butterflies sleeping out a winter for you just now? Have you been distracted, as I so often am, by the smaller, beautiful, but much less important blessings of ministry or gifting? Or has something come in to rob you of one of these truths, chipped away your faith in it until it no longer flies for you? I believe that today is a great day to go hunting in the attic for butterflies. A day to remind ourselves of the extraordinary, amazing, unearned and priceless blessings that are ours in Jesus. And perhaps even the day to pick up those that look like they have died, to hold them in your hand and to ask the Holy Spirit to breathe. May you be blessed with the waking up of butterflies in your heart today. Read through that list (in Ephesians 1), and ask God to highlight to you, in whatever way he can, which of these blessings he would like to bring back to life for you today. Then think, pray and journal about that blessing: draw pictures, write words, listen to music, sing… do whatever it takes to bring that butterfly back to life. A very apt analogy. The colour of that butterfly against the page is fabulous, too. Something really resonates here….I wonder if I was that friend? Kind of feels like it today.